Seafood is one of the most traded commodities worldwide. It is thus imperative that all companies and official control agencies ensure seafood safety and quality throughout the supply chain. 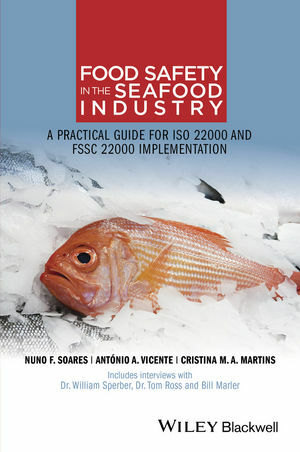 Written in an accessible and succinct style, Food Safety in Seafood Industry: A practical guide for ISO 22000 and FSSC 22000 implementation brings together in one volume key information for those wanting to implement ISO 22000 or FSSC 22000 in the seafood manufacturing industry. This practical guide is a valuable resource for seafood industry quality managers, food technologists, managers, consultants, professors and students. This book is a tool and a vehicle for further cooperation and information interchange around seafood safety and food safety systems. QR codes can be found throughout the book; when scanned they will allow the reader to contact the authors directly, know their personal views on each chapter and even access or request more details on the book content. We encourage the readers to use the QR codes or contact the editors via e-mail (foodsatefybooks@gmail.com) or Twitter (@foodsafetybooks) to make comments, suggestions or questions and to know how to access the Extended Book Content. Nuno F. Soares is Quality Manager at Vanibru, Comercio de Produtos Alimentares Lda, Portugal. Antonio A. Vicente is Associate Professor with Habilitation at the Department of Biological Engineering, University of Minho. Cristina M. A. Martins is Key Account Manager, SGS Group, Portugal. "A book being released today by Wiley-Blackwell just might be more effective in speaking to the seafood industry. Titled “Food Safety in the Seafood Industry: A Practical Guide for ISO 22000 and FSSC 22000 Implementation,” this book comes at the problem not through American legalize, but the more practical world of international standards.